Franklin Drake contacted me regarding a colleague of his, a Dr. Sibak. The doctor was a Vulcan priest, but worked with the science academy studying psionic phenomena on Vulcan. 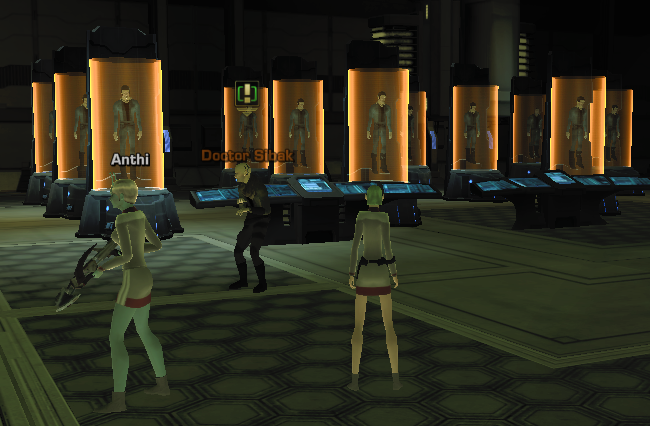 It appears the doctor went to the Donatu system to do some research. He hasn’t been seen in a couple of years and Drake would like me to check up on him. When you arrive in this chamber there is a console, and two phaser turrets to greet you. They immediately start attacking. It appears you have 2 choices the first is to attempt to solve an isolinear chip lockout via the console, or take the easy route and just blow everything up. As you have read before I hate the isolinear chip mini game and decided to blow everything up. On one of the tables in the middle of this room lies a body. After examining the body, you discover that it’s Dr. Sibak. While he appears to have been dead for a while, his body is preserved quite well. It appears as though someone has performed an autopsy on him as well as a neurological examination. Someone must still be here. A quick search of the room turns up notion other than his body. After examining each of the exits to the room, only the east exit is unblocked. After consulting with my first officer, we decided there was minimal risk in continuing. There are three sleeping quarters in the next area. The southern one is in disarray. The beds are strewn all around the room, and there are data pads all over the floor. A quick search of the data pads turns up a medical log. On stardate 89325.25 experimentation with a neural toxin to trigger damage and bio response shows promise. On stardate 89331.16 the log discusses clairvoyant projects being caused by ionizing radiation. Stardate 89332.14 The specimens were getting aggressive. They locked the interior containment doors with a simple Fibonacci sequence. Stardate 89336.92 they had a successful control facility regeneration. Stardate 89340.05 Replicated a space more conducive to concentration in the ionizing zone due to difficulty concentrating on telepathic transfer. 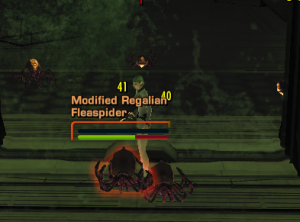 After returning to the research lab and proceeding through the west door, we were immediately attacked by a group of modified Regalian Flea spiders. 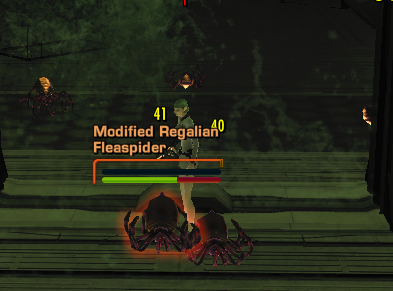 After dealing with the spiders, I checked the research logs in the console. It appears they were researching Bendii syndrome. Trying to find symptoms that manifest themselves in biology. While having little luck with the biological side of things apparently they discovered that aberrant behavior was a definite indication of Bendii syndrome. Searching the rest of the room yielded no clues. So I pressed on. 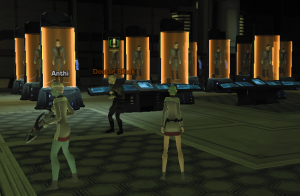 Imagine my surprise when I entered a room full of clones. No where in Dr. Sibak’s notes did he mention cloning. Typical Vulcan. Forget to mention the most important facts. 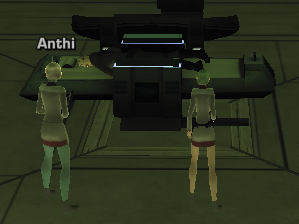 One of the clones was attempting to finish the doctor’s research. When the clone saw us, he attacked. Even after being driven insane by Bendii syndrome, he was a formidable opponent. An examination of the clones show that they were waiting to be decanted. Other than the normal replicative fading, they were exact copies. The one that attacked us showed signs of radiation poisoning. So the clones are still experimenting on each other. Worse yet, there was no way to tell how many were on the station. When entering the final room in the complex, I was attacked by at least six clones. Apparently, the clones were psionically imprinted so that he could test them for cures to his Bendii syndrome. At least, he did not manage to harm anyone other than himself and his clones. There is a very good reason for the directives against cloning. Situations like this one prove their value. This mission is a friday the 13th only mission. While it appears to be repeatable due to the timer, it can’t be repeated but once per friday the 13th. Which means the next opportunity to complete it is in July. The reward is a blue duty officer, and predictably it is one of the clones. Definitely worth doing.